Sometimes, we just don't see the forest for the trees or the polar bears for the tundra. For example, the July 30th, 2011 Canadian Press article "Astrophysicist works to line up his rockets to build Canadian launch site in BC" makes a big fuss over a "debate that's been making the rounds in the scientific and business communities for years without any progress being made." Dr Redouane Fakir. Photo c/o Canadian Press. But the article doesn't mention that this debate has been fought to a conclusion at least once before. This was during the period where the broad consensus, as epitomized on page 110 of the 1967 Chapman Report (generally conceded to be “Canada’s Original Blueprint” for space activities) was that "Canada will, within the next decade, need to launch small satellites at a rate that will justify supply from Canadian sources." And that time, Canada lost. The current article quotes BC astrophysicist and Space Launch Canada Director Dr. Redouane Fakir on the advantages of building a new Canadian rocket launch facility around the Estevan Point area of the Hesquiat Peninsula, on the west coast of Vancouver Island. These advantages include safety and range issues, economic and educational benefits relating to high technology facilities being located on Canadian soil, the vertical integration of satellite launches to provide more direct Canadian control and increased "space autonomy" for indigenous projects like the Near-Earth Object Surveillance Satellite (NEOSSat, which was originally scheduled for a 2007 launch but is still on the ground waiting for a ride to orbit, according to the July 28th, 2011 Montreal Gazette article "Asteroid-spotting satellite stuck on earth"). But Canada did once have it's own suborbital launch facility (the Fort Churchill rocket launch site in northern Manitoba, which was active from the 1950's to 1985). This point even receives a quick citation in the article, as does an Alaskan equivalent (the Kodiak Launch Complex in Alaska, which is the first commercial US spaceport not collocated on an existing federal launch range). 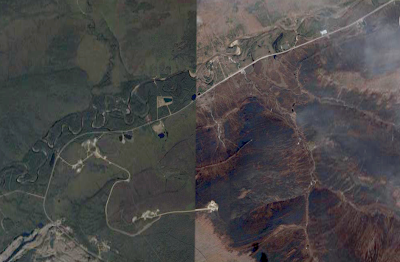 However, the article fails to mention a second, larger regional launch facility (the Poker Flat Research Range, just outside of Fairbanks, Alaska) or why the Alaskan facilities are still in existence while the Fort Churchill facility closed down in 1985. Poker Flat Research Range site overview. In the early 1960's, Neil Davis of the Geophysical Institute (a part of the University of Alaska at Fairbanks) decided to create a research rocket facility in Alaska that would have the unique advantages of being located near a permanent staff of university space physics scientists determined to study the aurora, and of being located at a site just to the south of the zone where most auroras occur. 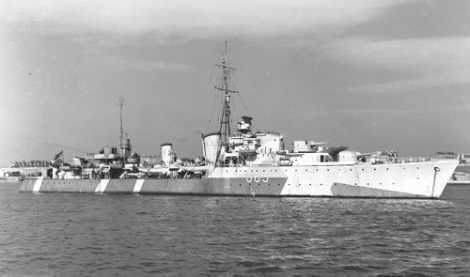 Davis' proposed range competed with a nearly identical $30 million facility built as a joint American-Canadian venture in the 1950's at Fort Churchill, Canada, on the shores of Hudson Bay. However, the Fort Churchill range had the major disadvantage of lying enough inside the auroral zone to limit research to only one kind of aurora. In 1968, developments elsewhere called for a minimal expeditionary rocket range to be built in Alaska solely to support the launch of six barium-release rockets of the Department of Defense. The Geophysical Institute secured a 25-year lease from the State of Alaska on about 5,000 acres of land on which to build the site, which later became known as Poker Flat Research Range (PFRR). The title to much of the land has since been transferred to the university. The federal crews wanted to shut down the rocket range shortly after they completed their barium-release experiments, but Davis had other plans. He agreed to provide necessary ground-based observations of the chemical releases from various locations only if he could launch his own NASA-sponsored, auroral zone rocket from PFRR, rather than from Fort Churchill as previously scheduled. The federal crews agreed, and Davis' rocket became the first civilian agency launch from the new range, establishing a precedent for the future. All seven rockets were successful and PFRR itself was launched into existence. Geophysical Institute scientists kept the range going on a shoestring budget for years until the facility proved both workable and scientifically useful. When 13 sounding rocket launches were scheduled for the winter of 1970, new construction began. The range was staffed and support instrumentation was installed. The basic facilities at PFRR were completed in 1972. Two years later, a geophysical observatory was constructed to house riometers, magnetometers, and other instruments used in routine experiments, along with all-sky cameras and meridian scanning photometers to support rocket launches. Since then, the range has undergone continual improvement. 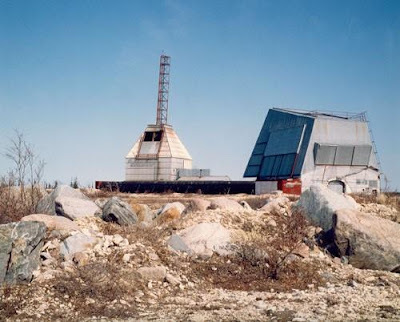 The US Army (which funded and helped to run the Churchill facility as part of its network of sounding rocket stations) ended it's involvement at Fort Churchill in June 1970, about the time that new construction began at Poker Flat. 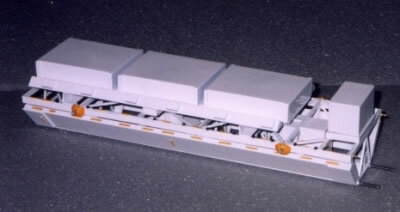 Although originally taken over by the National Research Council (NRC) to support the Canadian upper atmosphere research program, the Fort Churchill launching facility ended up being used only sporadically and was finally closed down in 1985. In essence, Canadian ambition and the highly developed infrastructure available at Fort Churchill (including the presence in the area of a major military base, a huge airport built during the second world war and substantial railway development for efficient movement of heavy equipment throughout the year) were trumped by the location of Poker Flat (which allowed for a wider range of atmospheric and ionosphere research) plus access to US capital (from the US Army) and the availability of nearby scientific expertise (the University of Alaska's Geophysical Institute operates Poker Flat under contract to NASA's Wallops Flight Facility). Dr Fakir and his colleagues at Space Launch Canada might want to keep these earlier lessons in mind as they move forward with plans to develop a new Canadian space launch facility. As mentioned at the beginning of this article, the battle has been fought before and Canada lost. Let's try not to let that happen again. After all, Canada must also have one or two stubborn academics lurking about somewhere. The abandoned Fort Churchill Rocket Research Range is now a national historic site which mostly means that no one is going to be launching anything from there any time soon. Canadarm as viewed during STS-116. 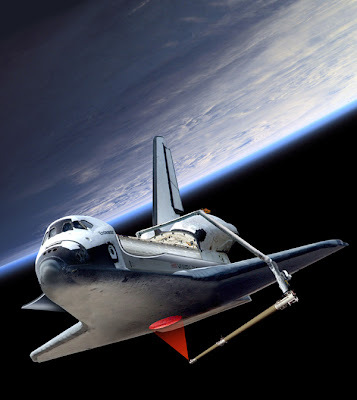 According to the July 19th, 2011 Postmedia News article "Arm-wrestling over Canadarm as tourist draw" there is no certainty that a complete example of the iconic Canadian contribution to the just completed US space shuttle program will ever end up on Canadian soil in a Canadian museum. In other words, a Canadarm might never return to Canada.Why would Postmedia News say this? Don't Canadians deserve a Canadarm of our own? The article quotes Canadian Space Agency (CSA) spokesperson Carole Duval as stating that, of the three remaining shuttles, only Atlantis has a Canadarm that can be acquired, since one arm is being held by the National Aeronautics and Space Administration (NASA) for observation and the other has already been changed into an orbital extension boom on the International Space Station (ISS). 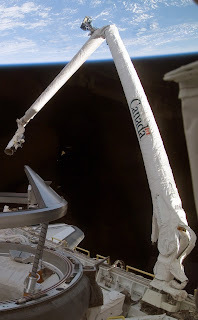 Earlier reports have indicated that the Canadarm from the shuttle Endeavour would end up at a Canadian museum, most likely the Canada Aviation and Space Museum in Ottawa. According to the November 17th, 2010 article posted on the NASA: Spaceflight Now website titled "Discovery's retirement plans provide insight into the fate of the robotic arms," Endeavour was scheduled, upon completion of her final mission, to "have her SRMS (the "shuttle remote manipulator system" which is the official name for the Canadarm) removed and sent back to Canada for display in Canada as recognition for their integral role in the space shuttle program." However, the Endeavour orbiter boom sensor system (OBSS) component of the Canadarm was to remain aboard the ISS as an extension arm for the ISS Canadarm 2. A graphic showing how the OBSS attaches to the Canadarm to survey the shuttle heat shields. The OBSS is simply a 50-foot boom carried on board the shuttles, which can be grappled by the Canadarm and serves as an extension of the arm, doubling its length to a combined total of 100 feet (30 m). The OBSS was used to inspect the shuttles in orbit for heat shield damage that could jeopardize the shuttle during re-entry. This 50-foot boom is the only component of the Canadarm that is remaining aboard the ISS. The actual Canadarm has returned to Earth and is still available to Canadians, just as soon as we get around to moving it up here. There have been no recent NASA reports suggesting that these plans have changed and it seems silly of Postmedia News to suggest otherwise. Canada is still going to get a Canadarm. It will just be a little shorter than it once was. Postmedia's reporter seems to have miscounted. There were originally four (4) Candarms built. One was turned into the boom that has been mounted to the Station. That boom is not an OBSS, it's close, but not the same. The three OBSS booms were built from spare Canadarm tubes plus purpose-built fittings at the ends and in the middle. When the requirement was developed for the Station boom, there were no spare tubes left so one of the four Canadarms was cannibalized for it's booms and new fittings were procured to turn it into the station boom. This left three SRMS (Canadarm) systems and three OBSS systems, one for each shuttle. So, if one SRMS is being held by NASA, then that leaves two available for museums. One is scheduled to come back to Canada because it was given to NASA and not bought by NASA. None of the OBSS booms is scheduled to come to Canada because NASA paid for all three of them. I dare say that if NASA had bought all of the Canadarms, then none of them would be coming back, and, to be honest, they've paid enough over the last 30 years to upgrade the Canadarm capabilities that they probably have the right to keep them all. I think it speaks volumes for the relationship between Canada and the US that they will give us back one of the pieces of this program. As for the comment "It will just be a little shorter than it once was," the OBSS was never part of the Canadarm system. It was a new system designed to work with the Canadarm, but it was not part of the original deal and was completely owned and paid for by NASA. The Canadarm we get will be as long as it ever was. Sure, it would be nice to have one, but there are a lot of museums in the US that have a greater right to it since their tax dollars paid for it. Canadians should be proud that it was a Canadian team that designed & built the OBSS systems in such a short period of time and that it has performed flawlessly for every mission it has flown on. Mr. Black - Just a note that the corrected version with Endeavour mentioned as the likely source for the CSA to get a Canadarm ran in most of the Postmedia papers. It's possible some websites had the earlier, incorrect version. The link you give has the corrected version. By the way it was not a reporting error. Duval gave me the erroneous information about the Atlantis. Then she called and emailed with the correct information. Hi Chuck - FYI you might check ownership of shuttle Canada Arms - only the protoype was paid for by Canada - all of the others were paid for by NASA and are therefore American owned and so if one ends up in Canada it will be because NASA donates it to us. Editors Note: I'm posting comments manually so don't be shy. Send your questions, queries, concerns and comments to mr.chuck.black@gmail.com. The 140 companies and organizations listed in the Canadian Space Directory as being part of the Canadian commercial space sector generated $3.1 billion CDN in revenue in 2009 according to the 2009 State of the Canadian Space Sector Report. Even better, as shown in part one of this post (titled: Basic Background Information), the firms in this sector are consistently growing faster than the economy as a whole. And best of all, the three largest firms in this sector, the communications giant Telesat, robotics expert Macdonald Dettwiler (MDA) and micro-satellite upstart COMDEV International (COMDEV) have emerged as the "three kings" of Canadian space focused activities. Any one of these three firms will likely have more effect on Canadian space activities than anything that could possibly happen at the Canadian Space Agency (CSA) over the next little while and much of the reason for this is the ongoing government policy to encourage research commercialization as the cornerstone of the Canadian science and technology strategy. The latest Conservative government under Prime Minister Stephen Harper may have gone so far as to attempt to define and state this explicitly in policy documents such as the Mobilizing Science and Technology to Canada's Advantage (May 2007) and the Mobilizing Science and Technology to Canada's Advantage Progress Report (June 2009), but the core policy has been in place for generations and enjoys wide support across party lines. It's also generally been a very, very successful policy. For example, Ottawa based Telesat (created in 1969 as a Canadian government owned or "crown" corporation under the Pierre Trudeau liberal government) was originally mandated simply to develop communications services in the far north. It used technology developed through another government department, the Communications Research Centre (CRC), which was then responsible for coordinating research and development activities in communications. 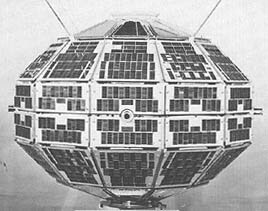 CRC activities then were much like CSA activities now and included most of Canada's early satellite launches such as Alouette 1, the first satellite designed and built by any country other than the United States or the Soviet Union. The technology transfusion from CRC certainly helped Telesat to become an iconic representation of how Canadians use space focused solutions to solve terrestrial problems, tie together the country and then continue forward to make a bit of money on the side. 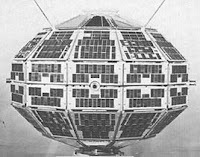 Telesat is directly credited with several space focused "firsts" of its own including the world's first domestic communications satellite in geostationary orbit operated by a commercial company (ANIK A1). It currently owns a fleet of 13 satellites plus operates 13 additional satellites for other entities and is building more. These assets are administered by 500 employees with a yearly budget twice that of the CSA, which makes Telesat the fourth-largest fixed satellite services provider in the world. But whatever the bottom line might show, the 2010 awarding of the John H. Chapman Award of Excellence to the first president of Telesat, Dr. David Golden for his "outstanding contribution to the Canadian space program" reinforces the longstanding perception that Telesat has always been more than just a business. One day writers will create fascinating historical accounts of Telesat's early activities in much the same way Pierre Burton wrote about the railroads when he called them "The National Dream." The same could also be said for Richmond, BC based MDA, although the genesis for this perception is more recent and grew out of the aborted sale of the space portions of the company to American-owned Alliant Techsystems (ATK) in April 2008. 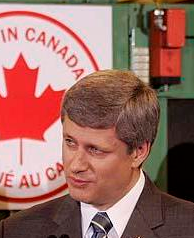 The sale, eventually blocked by the Conservative government, served to highlight national security and economic infrastructure issues which have not yet been formally addressed or resolved although MDA has since moved on to become the prime benefactor of Canadian government contracts relating to Earth imaging and arctic sovereignty. In fact, MDA has become such an iconic Canadian company that there is even the image of MDA Earth imaging satellite RADARSAT-2 (the follow on to the very successful RADARSAT-1) plus a second image of the MDA designed and manufactured DEXTRE robot (also known as the Special Purpose Dexterous Manipulator) on the back of the new, polymer Canadian $5 dollar bills, which are expected to flow into circulation by late 2013 as part of the 2011 Bank of Canada Frontier Series. MDA is presently focused on the not-quite finalized $280 million USD contract with satellite operator Intelsat for on-orbit satellite servicing (as discussed in my March 15th, 2011 post "Macdonald Dettwiler gets "Anchor Customer" for Brampton Robotics Plant") and a second internal initiative to either buy a space company with US roots or else return to shareholders the $793 million CDN acquired through the January, 2011 sale of the MDA property-information business (as outlined in my May 9th, 2011 blog post "Fighting Words from Macdonald Dettwiler"). As our final member of the "three kings," Cambridge, Ontario based COMDEV is the newest on our list but is also the firm with perhaps the most potential and the greatest part of it's story still to come. With 1300 employees and FY2009 revenues of around $240 million, according to Bloomberg Businessweek, it has about 2/3rd the cash flow and just under twice the employees of the CSA. Founded in 1974 to supply microwave equipment to the emerging space industry, the firm is currently moving into the miniaturized (or micro-satellite) market in a big way through the ongoing activities of COMDEV subsidiary, exactEarth Ltd. It is also moving forward with a micro-satellite based automatic identification system ( called exactAIS™), the maintenance of ongoing R&D relationships with Canadian universities including the University of Toronto Institute for Aerospace Studies (UTIAS) Space Flight Laboratory (SFL) and it's April 2010 purchase of Routes AstroEngineering. 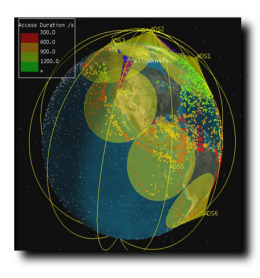 According to the firm website, "over 80 percent of all commercial communications satellites ever launched have had COMDEV technology on board." 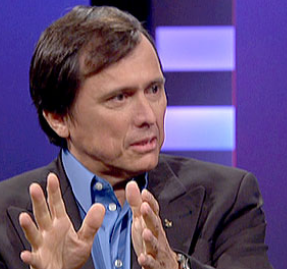 Even better, the firm recently hired ex-CSA astronaut Dr. Roberta Bondar as a member of the firms board of directors to help fill the gaps created following the decision by the COMDEV board to replace then CEO John Keating in September 2010. So now that we know where the Canadian space systems industry stands and the leading companies in the sector, it's instructive to take a look at where they sell products and where the sector as a whole is going. Those discussions will be the subjects of the third and fourth parts of this post. Daniel Friedmann. Preparing to present. Macdonald Dettwiler (MDA) President and CEO Daniel Friedmann and executive VP/ CFO Anil Wirasekara plan to take questions during the release of the MDA 2011 second quarter financial results on Friday, July 29, 2011, during the MDA quarterly earnings conference call, according to the July 14, 2011 Canadian News Wire (CNW) media advisory "MDA's Second Quarter 2011 results conference call alert." Expect sound MDA financials, especially given the contract extensions with the Royal Australian Air Force for the MDA Heron unmanned aerial vehicle contract (as per the July 13th, 2011 Australian Aviation article "RAAF Heron contract extended"), additional contract amendments with the Canadian Space Agency (CSA) covering the design phase of the RADARSAT Constellation mission (as per the June 28th SatNews article "MDA...Design Developments") and a couple of other items. But also expect many questions relating to the not-quite finalized $280 million USD contract with satellite operator Intelsat for on-orbit satellite servicing (as discussed in my March 15th, 2011 post "Macdonald Dettwiler gets "Anchor Customer" for Brampton Robotics Plant"), the effect of recent National Aeronautics and Space Administration (NASA) tests in this same area using MDA developed tools (as discussed in the June 23rd, 2011 Space News article "NASA Defends On-orbit Satellite Refueling Demonstration") and an update on the status of another MDA initiative (as outlined in my May 9th, 2011 blog post "Fighting Words from Macdonald Dettwiler") to either buy a space company with US roots or else return to shareholders the $793 million CDN acquired through the January, 2011 sale of the MDA property-information business. Dextre. A potential new role. 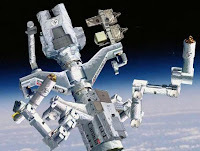 Speaking of on-orbit satellite servicing, the CSA seems to favor the NASA tests, at least according to the July 16th, 2011 Post News article "'Robotic handyman' to learn new tricks" which quotes Mathieu Caron, the supervisor of the CSA mission control team as stating "we're pushing Dextre a little harder." According to the article, the remotely controlled, Canadian built, Dextre robot (also known as the Special Purpose Dexterous Manipulator or SPDM) will learn to refuel satellites in flight and lay the groundwork to "save them from drifting off as space junk or burning up in Earth's atmosphere." Since MDA technology is part of the NASA tests (MDA manufactures and maintains DEXTRE), it's hard to see the downside to independent validation of this capability so perhaps the CSA advocacy is well placed. Telesat corporate HQ. Still in Ottawa. The proposed sale or recapitalization of Canadian satellite operator Telesat (as outlined most recently in my March 22nd, 2011 post "Telesat Sale (or Recapitalization) Near (or Not)") seems to have died without leaving a proper obituary to summarize the story. The most recent news report is the June 13th, 2011 post on the Advanced Television website under the title "Telesat sale hampered by dispute" which suggests that a disagreement over price has finally scuttled the deal. As far back as June 2009 I suggested that the "Telesat HQ Likely to Remain In Ottawa Just Down the Street from Golf Course" and in my February 4th,, 2011 post "Interesting Speculation About Telesat," I also suggested that the only real cost savings in a merger with another satellite operator would come from the closing of redundant control complexes. A number of mainstream Canadian news articles and editorials, created to coincide with the last flight of the US space shuttle program, have come out recently asking "what's next in space for Canada?" These include the July 8th, 2011 CBC News post "Canada's future space flight plans up in the air," the July 8th, 2011 Edmonton Journal article "Canada stalled in new space race" and the July 8th, 2011 Global News article “Securing Canada’s spot in the space race.” For it's part, the CSA has at least attempted to counter some of the questions that these articles are raising with the July 8th, 2011 press release "Canadian Space Agency President Steve MacLean's Space Shuttle Program Message" with it's suggestion of increased "scientific and technical use of the International Space Station" and preparation "for the journey to distant planets." It will be interesting to see if these mainstream media questions continue and begin moving away from the simple "who, what, when and where" into a more complex discussion of "why" the Canadian space industry is where it's at today. For those interested in some rousing imagery, below is a CSA produced tribute to the space shuttle program. Now that the last shuttle mission is almost complete, the next great space race can finally begin. Just like Harold Hill in "The Music Man," author and Mars Society President Robert Zubrin sees trouble ("right here in River City") which can only be nipped in the bud by making us "aware of the caliber of disaster indicated." 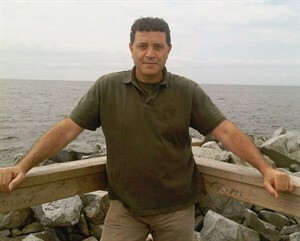 Zubrin, the author of "The Case for Mars: The Plan to Settle the Red Planet and Why We Must" has singled out the Variable Specific Impulse Magnetoplasma Rocket (VASIMR) electro-magnetic thruster for spacecraft propulsion, the Ad Astra Rocket Company (which is presently involved in researching and commercializing the VASIMR) plus former astronaut and current Ad Astra President/ CEO Franklin Chang-Diaz, who is credited with being the inventor of the technology. 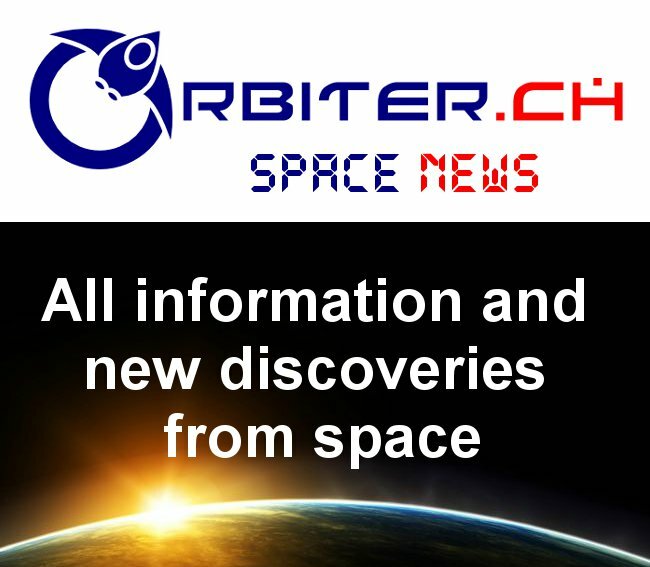 According to the July 13th, 2011 Zubrin written editorial on the Space News website titled "The VASIMR Hoax" the current focus on new technologies (especially VASIMR) is postponing, not facilitating space exploration and "only useful as a smokescreen for those who wish to avoid embracing" real initiatives which could begin now, using existing technology as previously outlined by Zubrin in his May 14th, 2011 Wall Street Journal editorial "How We Can Fly to Mars in This Decade—And on the Cheap." Franklin Chang-Diaz has a different assessment. And this latest editorial doesn't just have a title packed with hyperbole. Zubrin also explicitly calls VASIMR a "total falsehood" which "must be exposed." Best of all, the only way for the truth to prevail is for the people to attend a panel discussion titled: “VASIMR: Silver Bullet or Hoax" at the next Mars Society international convention in Dallas this August. Did Bob Zubrin actually get away with free advertising for his upcoming conference in a Space News editorial? Is this why the Wall Street Journal didn't run the latest Zubrin editorial? To achieve his much-repeated claim that VASIMR could enable a 39-day one-way transit to Mars, Chang-Diaz posits a nuclear reactor system with a power of 200,000 kilowatts and a power-to-mass ratio of 1,000 watts per kilogram. In fact, the largest space nuclear reactor ever built, the Soviet (era) Topaz, had a power of 10 kilowatts and a power-to-mass ratio of 10 watts per kilogram. But while Zubrin is also correct in his assessment that the current administration is "not making an effort to develop a space nuclear reactor of any kind" he omits to mention past and current efforts by the US and others, some of which are outlined in the November 3rd, 2009 Wired Science article "Russia Leads Nuclear Space Race After U.S. Drops Out." Of course, we can't forget that there are also substantial difficulties testing electrical propulsion units. The physics of magnetic nozzles are a complex mash-up of theory and guesswork which often provides unreliable predictions at variance from any measured, real world performance. For example, according to colleagues familiar with the testing requirements, a magnetic nozzle test requires a test volume that's large enough for the plasma to fully separate from the magnetic field "so as to insure that the outer fringes of the field aren't dragging on the plasma and killing most of the thrust that the inner parts of the field are producing." This means you need a huge vacuum chamber to perform any sort of accurate test of an electrical propulsion engine and the chamber needs to be capable of a very high vacuum during the test since even small amounts of residual gas can mess up electric-thruster testing. Or you could test the engine in space, which is big and has vacuum pretty much everywhere. 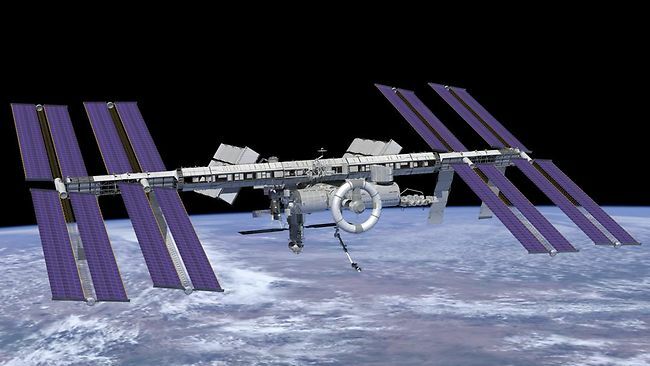 However, the only place presently available for testing in space is aboard the International Space Station (ISS), which has been considered and hinted at by the US and NASA, but is not yet formally scheduled for the VASIMR. But we can't forget about the ion thruster developed for the the Japan Aerospace Exploration Agency (JAXA) "Hayabusa" mission, which is a small scale, low powered electrical propulsion engine similar to VASIMR that has demonstrated its feasibility during interplanetary flight under real world conditions for over a thousand hours of continuous use during its seven year mission to retrieve a sample from the small near-Earth asteroid 25143 Itokawa. 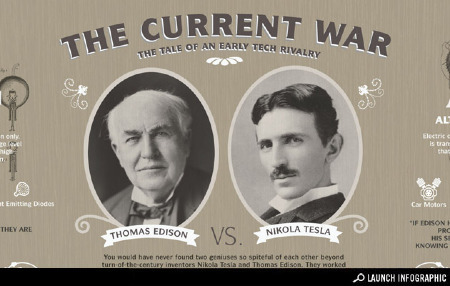 An earlier battle of competing technologies. And Hayabusa isn't unique. The NASA launched Dawn spacecraft which has just entered orbit around the asteroid Vesta, uses xenon ion thrusters pioneered during the Deep Space 1 probes, a part of the NASA New Millennium Program focused on testing high risk technologies. All of which means that VASIMR is certainly not a hoax, but it does suggest that perhaps Chang-Diaz is also a bit more optimistic in his claims for this specific electrical propulsion system than the existing evidence warrants. 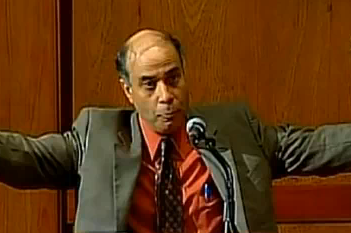 In essence, both Zubrin and Chang-Diaz are exaggerated their present case. Why would they be doing this? When the British National Space Centre (later the UK Space Agency) bumped up against competing claims regarding the capabilities of the Reaction Engines "Skylon" pilotless, reusable space plane several years ago, they set up a series of proof-of-concept engineering assessments to validate assumptions and figure out what the actual capabilities and bottlenecks were. Skylon passed and ended up with increased funding but if it hadn't passed the review, then it would have lost funding, which is what should happen with grown-ups operating in the real world of science and engineering. But that doesn't seem to be happening in the US, where the idea of Bob Zubrin calling out Franklin Chang-Diaz for the modern day equivalent of a public gunfight at high noon for perpetrating a "hoax" doesn't seem to strike anyone as being silly. We seem to be entering a new era where showmanship, entertainment, political glad-handling, pork-barreling and hyperbole will each be necessary in order to suitably move forward new technologies in a world where science and engineering are starting to take a backseat to bread and circuses. Maybe we do have trouble. The way I see it, people are so bombarded these days with everything, it takes circus stuff to get their attention. Many people don't even see the point of space exploration given all the problems we have at home or when faced with whole populations dying of hunger. Of course, I don't want to go down on the record as somebody against space exploration, which is how that might sound, or to come across as being naive about its benefits. What it comes down to (as I explain to everybody I end up on this topic with) is that each individual person has some limited range of interests that truly get them fired up and it is within this range of interests that society is best served by having them occupied. There are plenty of people to serve every conceivable need and the rocket scientist has just as justifiable a place in society as the medicine man, the plumber, the folks providing communications equipment for pro-democracy demonstrations or even the "music man." So lets let Zubrin be Zubrin and the same for Chang-Diaz. It's worth noting the July 6th decision by the US House of Representatives appropriations subcommittee that oversees the National Aeronautics and Space Administration (NASA) budget to provide no further funding for the over budget and behind schedule James Webb Space Telescope (JWST). 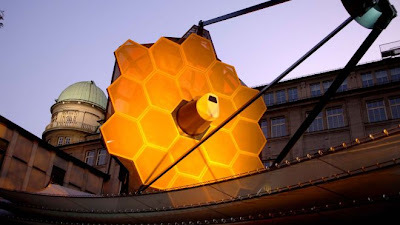 A full size model of the JWST, on display in Munich, Germany. Photo c/o EADS Astrium. 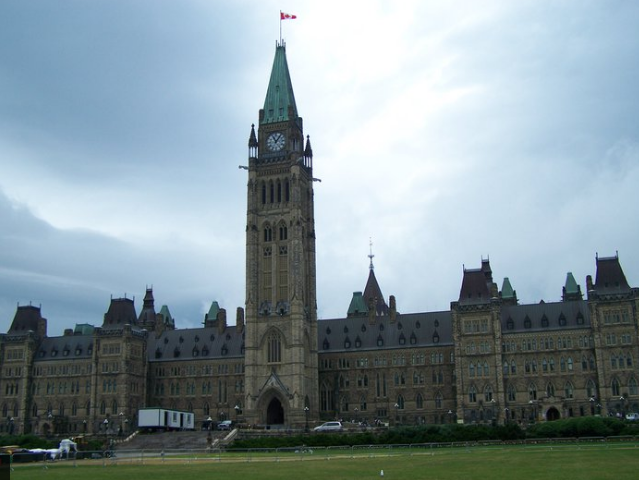 Unfortunately, this decision seems to have caught Canadian government officials by surprise, according to the July 7th, 2011 National Post article "Canadian Developed Space Telescope nixed by US Congress." The article states that "Federal Industry Minister Christian Paradis, at Cape Canaveral Florida with his 10-year-old son to watch the Friday’s final launch of the shuttle Atlantis, seemed to be caught off guard by the development." Hubble compared to the JWST. 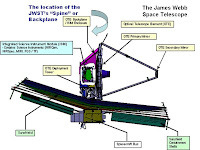 The original JWST contract, as described by the September 11th, 2002 New York Times (NYT) article "Next Generation Space Telescope Chosen to Peer into Past" was to cost $824.8 million USD and expected to launch in 2010. 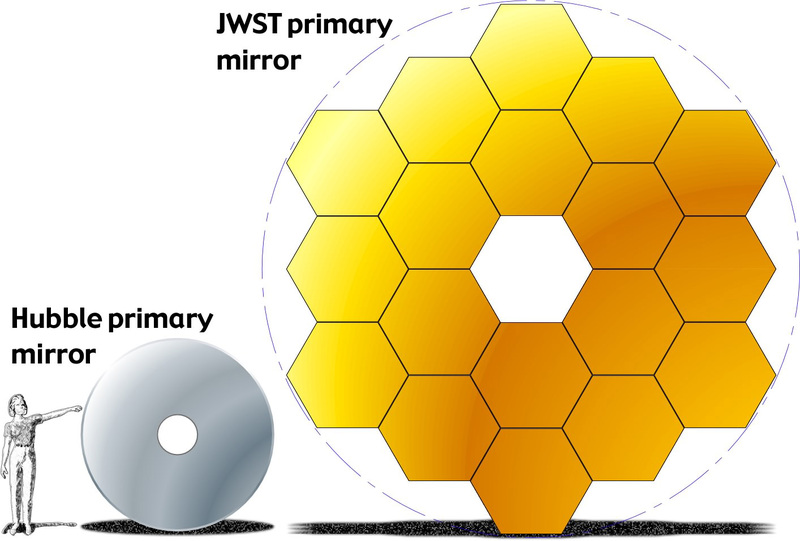 According to the article, the telescope would have "a segmented main mirror that will unfold to capture many times as much light" at the Hubble Space Telescope, which the JWST was originally designed to "compliment." The first large formal budget increase (after a series of incremental and largely unpublicized increases) was in 2005, following an "independent" review from JWST contractor Northrop Grumman and the NASA science instruments and support (ISIM) team for the JWST. According to the James Webb Space Telescope Project History website (part of the Space Telescope Science Institute), this first major review was a "financial shock" with costs rising from a pre-review estimate of about $2 billion to 3.5 billion USD and with the expected launch date pushed back to "no earlier than June 2013. By 2010 the project had taken up so much of the US space budget, that it was impacting on other projects. The August 12th, 2010 Spaceflight Now article "NASA says JWST cost crunch impeding new missions" reported that "much of NASA's funding for astrophysics missions is being gobbled up by the James Webb Space Telescope," which is now the "the $5 billion successor to the Hubble Space Telescope." The article went on to state that, although NASA is committed to launching JWST "as close as possible to its June 2014 target" launch date, there will likely be further cost increases. According to the article, "getting JWST launched by June 2014 (the expected launch date at the time), or at least close to that date, will almost certainly require more money than predicted today." 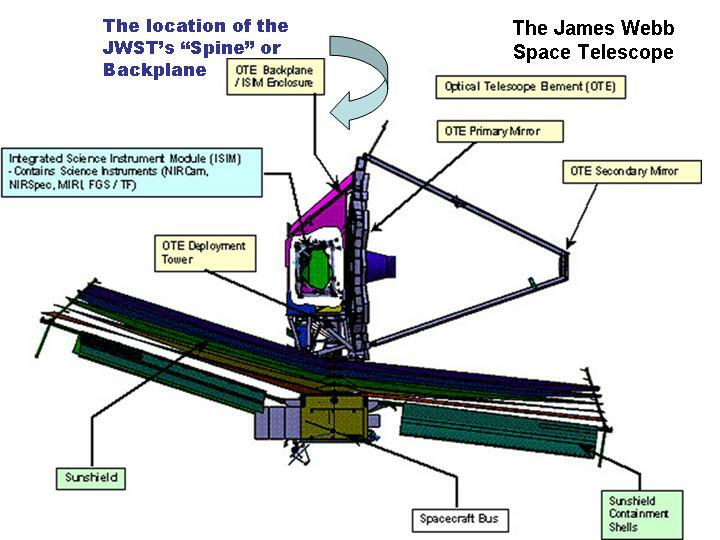 JWST graphic highlighting the location of the "spine." The NYT reported on November 10th, 2010 that the James Webb Space "Telescope Is Behind Schedule and Over Budget, Panel Says." At that time, no Canadian subcontractors (which include Com Dev International and Macdonald Detwiller) nor anyone at the Canadian Space Agency (CSA) had publicly commented on the project overruns. I suggested in my November 15th, 2010 blog post "Quick Notes on Law Firms, Universities, the James Webb Space Telescope, Com Dev and the CSA" that they likely wouldn't ever do so since Canada is only making a small financial contribution (around $148 million over the life of the project) and wants to remain friends with the US prime contractors. Current cost of the JWST as of today is estimated at around $6.5 billion USD. As outlined in the July 12th, 2011 Space.com article "Scientists Condemn Plans to Scrap Hubble Telescope Successor" the JWST is presently expected to launch sometime in 2018, assuming of course that the House of Representatives and the US Senate decide to vote against the House Appropriations subcommittee recommendations. The current JWST cost compares poorly to the Hubble Space Telescope cost at launch (on April 24, 1990 from the space shuttle Discovery during STS-31) of 1.5 billion USD. Even worse, the JWST hasn't launched yet, isn't expected to do so for almost a decade and is already four or more times the cost of the Hubble for the same period. Mr. Paradis might want to take the above into account the next time a reporter asks him about the JWST and Canada's participation in the program. As an experienced aerospace project engineer with 25+ years designing, building & testing hardware as well as planning and costing programs, is never ceases to amaze me when a huge program, such as this or Constellation (to name just a few), totally blow their schedules and budgets. Managing large programs isn't easy, to be sure, but basic project management 101 teaches you that you have to know your requirements up front (Item 1) if you are to have any hope of meeting your schedule and budget. You also have to have a realistic risk budget (Item 2) to cater for those things that you don't know going in. Lastly, you have to have the stones to stop everything if it appears you were grossly wrong with either Item 1 or Item 2 and you have to stop everything well before you run out of either money or time. It is beyond me how these things keep happening in the aerospace industry. It certainly appears as if the contracting agency (in this case the US government) simply doesn't know how to initiate, cost, plan or execute large programs. The F-22 and F-35 programs have had similar issues. The National Aerospace Plane (originated under the Reagan administration and cancelled in 1993) died of the same causes. Why is it impossible for these programs to be run correctly? There are a lot of programs that do run properly and come in on time and, gasp, even under budget, but many of the largest programs seem to run on forever, spending money every minute. I work in the space industry and, let me tell you, when we sign up for a fixed cost program, every cent and minute is accounted for. If something is not in the plan, it doesn't happen. If something goes wrong, there is a budget we draw on to fix it and if that budget is expended and the problems still exist, we either don't fix the problem (if it can be lived with) or we use company money to fix it. And, let me tell you, nothing focuses a corporations energy more than to use its own money to fix a problem. It seems to me that these programs are running on (and on) for a couple of reasons. First is that the sub-contractors or the agencies looking for budget are simply are not being honest when programs start. The change in the JWST from $850M to $2.5B is an example of that. The fact that the requirements were allowed to change enough to justify that cost increase is simply poor program management right from the start. Next, there seems to be no rational management of costs and risk budgets. It is simply not credible to state that because no-one has ever done this before, there is no way to effectively monitor or contain costs. Once you start seeing problems that even smell like they might be of a nature that could blow your risk budget, prudent management stops the program and investigates to see if it is really possible to do this thing or not. The answer may actually be "no, it's not possible." The response to that answer is to actually stop the program and either reduce the scope to something you can actually do or to stop the program entirely and perform the basic technical development needed to reliably complete the task. In this case NASA seems to be suffering from the inability to say that they do not "have the technology" to build the JWST as advertised and the even more problematic inability to stop the program until they do. And that is the crux of the problem for this program. If managers are not allowed to stop the program, it is tantamount to giving everyone a blank cheque book for costs and overruns. Once you become too big and important to kill, then excesses can no longer be contained and everyone knows it. Even the best intentioned small project managers within the program will say, "Heck, I'll over run a few thousand, it's no problem. My buddy over in Dept X says they've been allowed to over run millions, so my little amount is fully justifiable." A rot sets in and then you're doomed. JWST may just be doomed and, perhaps, it should be. Unfortunately, what is unlikely to happen is that the management of the program pay the price for their poor performance. The culture within NASA of late doesn't seem to be capable of effectively dealing with large programs and doesn't seem to be able to appropriately take responsibility for their own poor management performance. And before anyone starts to blame the contractors, the framework for how any contract is run is created by the contracting agency, in this case NASA. If they have permitted the subs to work on a program without the subs own money being "in the game," it is completely up to the agency to manage the overall program correctly. NASA has the right and responsibility to ensure that each subcontractor is fulfilling their part of the contract and I'd bet a year's pay that any investigation will not find any irregularities in the subcontractors' performance. It is NASA who is supposed to be herding the cats, and in this case (in many cases) they simply are NOT up to the job. Until governments find a way for their agencies (this is not a unique US government problem, of course) to not only manage properly, but be held responsible for their failures, this sort of problem is going to persist. As aerospace programs get fewer and more expensive, look for this trend to continue. Not every fourteen year old has an all consuming adolescent passion that can be turned into a full-time and profitable business. But some of us get lucky or are skilled enough to make it happen, despite the odds. 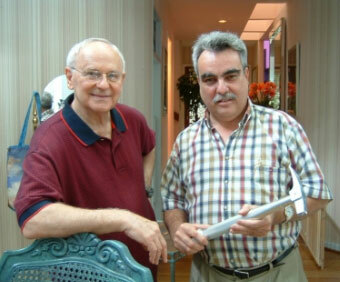 Astronaut Alan Bean with Nick Proach, who is holding the hammer used by Bean on the surface of the moon during the Apollo 12 mission in November 1969. For Nick Proach, the current owner of British Columbia based Proach Models, it all started back in 1971 when he built a small scale model of the much larger Apollo Lunar Roving Vehicle (known then as the "moon buggy" after its strong resemblance to the high and wide wheeled Volkswagen "dune buggy" from the same period) which was to be used for the Apollo 15 mission from July 26th to August 7th, 1971 to help transport astronauts around the Moons surface. He told reporters at the CTV Television Network (now a part of Bell Media) about his model and before he realized it he was building the entire Apollo 15 landing site in miniature for the network to use during their coverage of the moon mission. 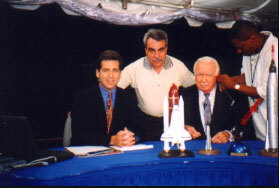 CNN correspondent Myles O’Brien with Nick Proach and special guest Walter Cronkite during the CNN coverage of STS-95 in October 1998. More projects followed and in 1994, he formed Proach Models to sell his models to news outlets looking to make space activities understandable to the population; museums dedicated to memorializing the glory days of space flight; corporations, space centers and government agencies looking to possess museum quality replicas of those early spacecraft and private collectors worldwide interested in highly detailed models of space hardware. The 1/48th scale model ISS S1 Truss. Two of his models have even gone into space. A foot long, high-fidelity 1/48th scale model replica of an “S1 Truss (part of the keel structure) for the International Space Station (ISS), was flown to the ISS on the STS-112 mission, which lifted-off on October 7, 2002. The model was designed to help astronauts plot and plan their extra-vehicular activities (EVA’s), when hooking up the S1 truss to the other sections of the ISS. The Proach model was also used during an in-flight press conference to explain STS-112 mission details to the media and public. The model Richard Garriott took to the ISS in 2008. And video game entrepreneur Richard Garriott, took a tiny model of the Soyuz TMA spacecraft into space with him aboard the full sized Soyuz spacecraft he used in his self funded trip to the ISS in 2008. The model measures over an inch long and is approximately 1¼ inches across the solar panels. 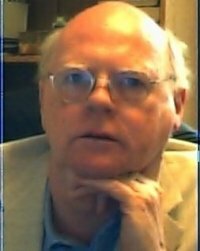 Proach is also a space flight historian with a vast knowledge and library of records from all manned and unmanned spaceflights along with an extensive print and video library and takes time to keep up with developments in the aerospace field as a regular contributor in space-related magazines and periodicals. He's also a promoter of aerospace education with a strong belief that manned space flight contributes positively to the economy and is the biggest single peace-time driver of technological advancement. But mostly, Proach just likes to build the most historically accurate and highest detailed museum quality models possible and do his part to help chronicle an important piece of our history. Anyone looking to learn more about his models should go to his web page at http://www.spacemodel.com/. Tell him that you were referred by the Commercial Space blog. 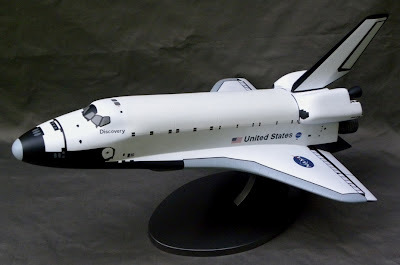 A 1/48th museum quality scale model of the shuttle Discovery, available from Proach Models. Labels: 2010 Canadian Space Summit, Funding "rocket science"
Is Mars a Part of Canada's Space Future? One of the people involved with the ongoing Canadian discussion flowing around the development of an informed Canadian space policy is Randy Shelly, who most recently contributed to my January 11th, 2011 blog post "Favoring Informed and Spirited Public Discussion." Morning on Mars, December 18th, 2008. From the Desi Colors website. He's a subject matter expert with the Department of National Defence (DND) Surveillance of Space (Sapphire) project and a former Canadian Space Agency (CSA) project manager involved with the SCISAT-1 Atmospheric Chemistry Experiment (ACE) satellite. I was pleased to read about Marc Garneau pushing for an all Canadian Mars mission as outlined in the July 4th, 2011 Postmedia News article "The Next Horizon: Former astronaut Marc Garneau, talks about being first, seeing Earth from space, and what should be next — Mars." This might seem overly ambitious to many Canadians, even some in the space sector, but it would have many benefits for Canada and it does not have to be an expensive project. The benefits to Canadians include further technology development in areas where we already excel, and international reputation, which is of value beyond the space sector. 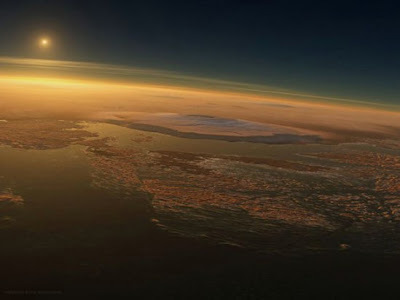 There has been a lot of discussion in recent years about a human mission to Mars, but while this seems to be an exciting prospect, in order to assure a safe mission, the costs would be high and the real benefits of little value. We have already proven that we can land people on the Moon and return them to Earth so repeating it for Mars would be more of the same. I am not suggesting that a human mission to Mars will not eventually happen, but I believe it is many decades in the future; and within those decades, robotic technology and artificial intelligence will have developed to the point where adding people to a mission would have little or no benefit and would increase costs at least by a factor of a hundred. The future of space exploration is definitely in the area of robotics and those who develop that technology will be in the best position to benefit. What most Canadians would be interested in is the return on the investment for our government’s expenditure on such a project: A Canadian Mars mission would be an excellent means for Canada to advance our robotics and artificial intelligence technologies to the next level. In addition to opening up opportunities for the sale of Canadian technology, the enhancement of Canada’s reputation from a Mars mission, would encourage other countries to look to Canada for other technology products. Canada already has a reputation for cost-effectiveness in the space sector and a Mars mission could be done by using the methods that we have successfully used to get back a lot for our investments in our past programs. I would like to see the Canadian Space Agency challenge industry and universities to design a complete mission for under $150 million. This cost-capping approach initially might not be entirely successful, but at least it would lead us in the right direction to finally arrive at the best value for money spent. 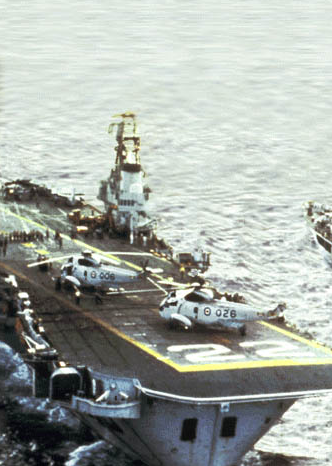 For more coverage relating to Marc Garneau's recent comments, please see my July 4th, 2011 post "Ground Control to Marc Garneau" and my July 5th, 2011 post "A Nautilus-X for the Next "HMCS Bonaventure." Dusk engulfs Parliament Hill, July 5th, 2011. A new dawn always follows. It's only been up for a day, but my July 4th, 2011 post "Ground Control to Marc Garneau" has already spawned more than its fair share of private comments, most of them focused on how much easier it is to critique a plan of action than to originate one. But there are several obvious research areas where a bit of judiciously provided Federal government money could make the difference in guaranteeing future Canadian space competitiveness across a wide range of opportunities. These potential research areas and emerging technologies aren't focused on unmanned robotics or simple Mars rovers. Instead, they are directly applicable to solving propulsion, orbital construction and environmental/ habitation concerns relating to long duration, manned, interplanetary spaceflight. This makes them a far better way to ensure the continuation of the Canadian astronaut corps than anything wrapped around unmanned activities could ever possibly pretend to be. Here are four specific areas where Canada could contribute, right now, to the proposed Nautilus-X interplanetary spacecraft as described in the February 14th, 2011 Popular Mechanics article "New NASA Designs for a Reusable, Manned Deep Space Craft, Nautilus-X" or to any other manned spacecraft program for that matter. A conceptual design for the Nautilus-X MMSEV, non-atmospheric universal transport intended for lengthy multiple mission space exploration. The design is based around inflatable modules built by Bigelow Aerospace with swappable propulsion systems including electrical propulsion like the variable specific impulse magneto-plasma rocket or VASIMR (which is scheduled for testing about the International Space Station), requires only "two or three rocket launches" to prepare, has a two year range (and could reach Mars and then return in a matter of months instead of years), carries six people, includes protection from solar radiation and could be available within ten years for only $3.7 billion USD (at least according to the Popular Science article. 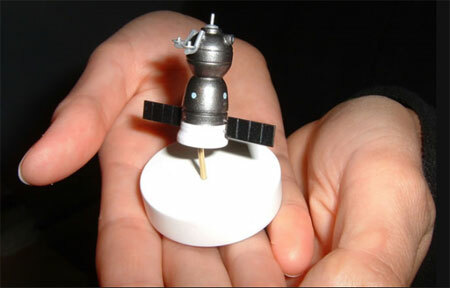 The HobbySpace website also has a pretty good description of the spaceship here). How could Canadian companies contribute to this project, should it ever receive funding and move forward? Some would argue that we are already contributing to the propulsion component through Nova Scotia based Nautel Limited, which is acting as a subcontractor to US based Ad Astra Rocket Company to develop RF power solutions for deep space plasma propulsion, according to the article "Nautel: Where it Really is Rocket Science" posted on the company website. Of course, money for this initiative is tight and the company makes most of it's profit from the design, manufacture, sales and support of high power radio frequency (RF) products for AM and FM broadcast, navigation, industrial and space-based applications. Perhaps the Canadian Space Agency (CSA) could help out with a couple of contracts to help move this technology forward. Since the Nautilus-X proposal also requires "two or three" rocket launches to prepare, it is expected that there will be a requirement for orbital construction. For this, we can turn to Canadian space systems company MacDonald Dettwiler (MDA), with it's legacy of expertise using the iconic CanadArm to help build the International Space Station and it's current $280 million USD contract with satellite operator Intelsat to perform on-orbit satellite servicing as outlined in my April 3rd, 2011 post "A Backgrounder for On-Orbit Satellite Servicing." The Canadarm unloading cargo during STS 116. Generally considered the most experienced space robotics company in existence, MDA has progressed far beyond the robotics generally required to build a small Mars rover, although its not been so proud as to refuse a recent CSA contract for the development of a small Moon rover. For food and life support, we could contribute through some of the tools being proposed as part of the Canadian Advanced Life Support Systems (CanALSS) Roadmap as described in the April 18th, 2008 CSA press release "Proposed Canadian Advanced Life Support Systems (CanALSS) Roadmap Workshop Announcement." The CanALSS program is ongoing and was most recently discussed by ComDev International VP Ron Holdway at the last Canadian Space Commerce Association conference and AGM in March 2011 as described in my March 20th, 2011 post "News and Notes from the 2011 CSCA Conference." The concept of building space greenhouses to grow food and provide an ecology for space habitats seems like a slam dunk for space agencies and organizations looking at long duration missions and trips to Mars, even if they're not using the Nautilus-X. We might also want to take a look at the work being done by Ivan Milan, the owner of EcoSpace Engineering and the University of Guelph, which together have developed a methodology utilizing insect larvae to process organic waste into "nutrient rich organic fertilizer and protein rich animal feed in just a few days without the use of chemical additives and absolutely no residue or pollutants" according to the EcoSpace Engineering website. According to the May 6th, 2011 post "Manning Innovation Awards: Trends in Canadian Innovation" on the MaRS Discovery District website, Milan and Ecospace have even recently received a Manning Innovation Award, which is usually a first step in Canada to additional funding. So we've got Canadian companies capable to of dealing with propulsion, life support, waste disposal and construction. With so much of the technology available in Canada to build major components of an interplanetary, manned spacecraft, it's odd that our government and CSA leaders are focused instead on smaller, unmanned projects. While the Nautilus-X is not presently funded, quite a number of other potential projects are coming down the pipe just waiting for innovative companies to contribute useful technology relating to propulsion, construction and environmental/ habitation concerns. Canada would be well served by encouraging it's space system firms to contribute to these projects. At some point, perhaps Canadian companies could even begin contributing enough to have vessels named after famous Canadian ships like "Bonaventure" or "Haida." Then we'd really "punch above our weight." I thought you might be intrigued by a new Canadian scientist who has innovated, developed and built two different types of electric space propulsion systems whilst at the Massachusetts Institute of Technology (MIT). Both projects are partially funded by the National Science and Engineering Research Council (NSERC). The Micro-fabricated Electrospray Ion Thruster (MEIT) in particular is suitable for micro and nano satellites as its designed to scale up using innovative micro-fabrication techniques applied to porous materials to eliminate the need for heavy pumps and valves in the complete engine. It's very small and lightweight. The other engine is for larger satellites and is called the DCF thruster. You can get details and the respective PhD thesis and related publications by clicking on the links at http://www.wix.com/dancourtney/main#!__projects and http://www.wix.com/dancourtney/main#!__phdabstract. Would Canadian industry or DND be able to exploit these technical advances? Who knows but nano and micro satellites currently do not have any propulsion, but with the MEIT would enable far wider mission scenarios. Even just being able to de-orbit under control and in a short time rather than being space junk could be useful.